Vance's The Dying Earth - Review by S.E. Review Summary: The Dying Earth, is beautiful, pulpy adventure. It is a series of six connected short tales (chapters), each being a mix of (Sword & Sorcery) and (Sword and Planet)...so consider it (Sword & Sorcery & Planet). And, it is an important classic, first published in 1950; Jack Vance's codification of magic items & spells proved influential in RPG-game design. Dying Earth Series: Tales of the Dying Earth: The Dying Earth/The Eyes of the Overworld/Cugel's Saga/Rhialto the Marvellous is an omnibus edition of the four novels written by Jack Vance (1916-2013) between 1950 and 1986; the first is simply The Dying Earth, which is itself a collection of six short stories. With the recent passing of Jack Vance (1916-2013), the Sword and Sorcery Group is reflecting on his work this Summer (July-August): The Dying Earth (1950) is the first in the series (the next three in sequence are: (2) The Eyes of the Overworld (1966), (3) Cugel's Saga (1983), (4) Rhialto The Marvellous (1984)). Codifying Magic - Role Playing Game (RPG)s: Tolkien maybe credited for inspiring "fellowships" of Dwarves, Elves, and Humans to go adventuring (a key trope for RPGs), but his magic-system was never codified well. Some ontology, or approach to classifying, was also needed ...and already provided, actually. Before "Lord of The Rings", Vance delivered The Dying Earth, and seems responsible for providing RPG-franchises with the needed approach: captivating brand names. Vance's Items and Spell titles simply exhibit self-evident credibility : Magic Items such as Expansible Egg, Scintillant Dagger, and Live Boots...and Spells such as Excellent Prismatic Spray, Phandaal's Mantle of Stealth, Call to the Violent Cloud, Charm of Untiring Nourishment. Three decades after The Dying Earth was published, the broader fantasy culture apparently caught on to the branding of spells and magic items (i.e. 1980's Dungeons & Dragons… or even magic-based card games like Pokemon, etc.). "Where does beauty vanish when it goes?" "[Turjan] considered its many precursors: the thing all eyes, the boneless creature with the pulsing surface of its brain exposed, the beautiful female body whose intestines trailed out into the nutrient solution like seeking fibrils, the inverted inside-out creatures...Turjan sighed bleakly. His methods were at fault; a fundamental element was lacking from his synthesis, a matrix ordering the components of the pattern." "For some time I have been striving to create humanity in my vats. Yet always I fail, from ignorance of the agent that binds and orders patterns." "This is no science, this is an art, where equations fall to the elements like resolving chords, and where always prevails a symmetry either explicit or multiplex, but always of a crystalline serenity." Turjan needed more knowledge to complete his goal. This compels him toward making a woman who appreciates beauty (to compete with another woman who cannot detect beauty). 2) Mazirian the Magician: This chapter has significant overtones of Clark Ashton Smith's Maze of Maal Dweeb, Xiccarph tales (1935, 1930)...in which an alien sorcerer had the "caprice to eternalize the frail beauty of women," maintaining them in a garden. Here, the beautiful T'sain dies to save her maker, Turjan, in a magic-filled chase through an alien sorcerer's garden. This excerpt demonstrates how Vance never ceases to pour out the colors! "Certain plants swam with changing iridescences; others held up blooms pulsing like sea-anemones, purple, green, lilac, pink, yellow. Here grew trees like feather parasols, trees with transparent trunks threaded with red and yellow veins, trees with foliage like metal foil, each leaf a different metal--copper, silver, blue tantalum, bronze, green iridium. Here blooms like bubbles tugged gently upward from glazed green leaves, there a shrub bore a thousand pipe-shaped blossoms, each whistling softly to make music of the ancient Earth, of the ruby-red sunlight, water seeping through black soil, the languid winds…"
"Pandelume created me," continues T'sais, "but there was a flaw in the pattern." And T'sais stared into the fire. "I see the world as a dismal place: all sounds to me are harsh, all living creatures vile, in varying degrees--things of sluggish movement and inward filth. During the first of my life I thought only to trample, crush, destroy. I knew nothing but hate. Then I met my sister T'sain, who is as I without the flaw. She told me of love and beauty and happiness--and I came to Earth seeking those." "Even here is beauty," he whispered. "Weird and grotesque, but a sight to enchant the mind." 4) Laine the Wayfarer : Laine the arrogant magician is challenged to repair a piece of art: Lith's tapestry. Therein is depicted the Magic Valley of Ariventa, but it has been cut in half. Can he restore it? 5) Ulan Dhor: This is a fun piece, with more sci-fi than the others given the reactivation of ruined technology. The artistic elements are less covert here. There are two embattled groups that literally cannot see another. They signify themselves not with classic blazonry...but by simply by color: Green vs. Grays (vs. Reds)! "This is the Museum," said Guyal in a rapt tone. "Here there is no danger...He who dwells in beauty of this sort may never be other than beneficent…"
All in all, a recommended read to any sci-fi and fantasy buff, and to any reader who also likes RPGs. Feel welcome to join the discussion (at any time...even if the official group-read time expires):Group-Read Link. Labels: Art, Muses, Reviews - by S.E. Packaging design to delight Goodreads.com Giveaway Winners. Procter & Gamble coined the key instances in which a customer becomes impressed with a product as "Moments of Truth." Historically, the First Moment of Truth (FMOT) refered to when the customer saw a package on a store shelf; this experience influenced not only the possible purchase...but it set up expectations for the quality of the product. The Second Moment (SMOT) was the instance when the product was used, and the customer assessed whether or not the experience matched expectations. With the internet changing customer habits, another instance was eventually coined: the Zero Moment of Truth (ZMOT, Link), which is when customers form expectations before directly contacting (touching) the product! How does this framework translate to today's book selling? In this case, the ZMOT occurs when readers comb through online reader/customer reviews. Given that fewer and fewer books are purchased in an actual bookstore, the FMOT will likely be when a book arrives by mail (though one may argue it is when the cover is seen...online...or on an electronic device). The SMOT is when the reader actually reads the book. The main premise is to identify all touchpoints between the consumer and the product, and then enlighten each instance. "Every touchpoint with a reader is important..."
The end of one reader's experience will start the process for a subsequent one, but less than ~10% of readers will post reviews (a statistic based on my own experience). This amplifies the need to impress potential readers whenever possible. "Giveaways" are an efficient way to jumpstart the process; these are online-events in which readers signup for complimentary copies of the book...usually with a non-binding commitment to review it. Every several months I host Giveaways of hardcopy (via Goodreads.com) and electronic books (via LibrayThing.com) for Lords of Dyscrasia. Every touchpoint with a customer is important, and a crafty partner of mine reminded me early on to not overlook one. With the focus on on-line/virtual touchpoints, I almost neglected to make the FMOT delightful for those receiving hardcopies by snail mail. Thanks to her, the books awarded to Giveaway winners have always been wrapped to impress (thanks Designlab!). 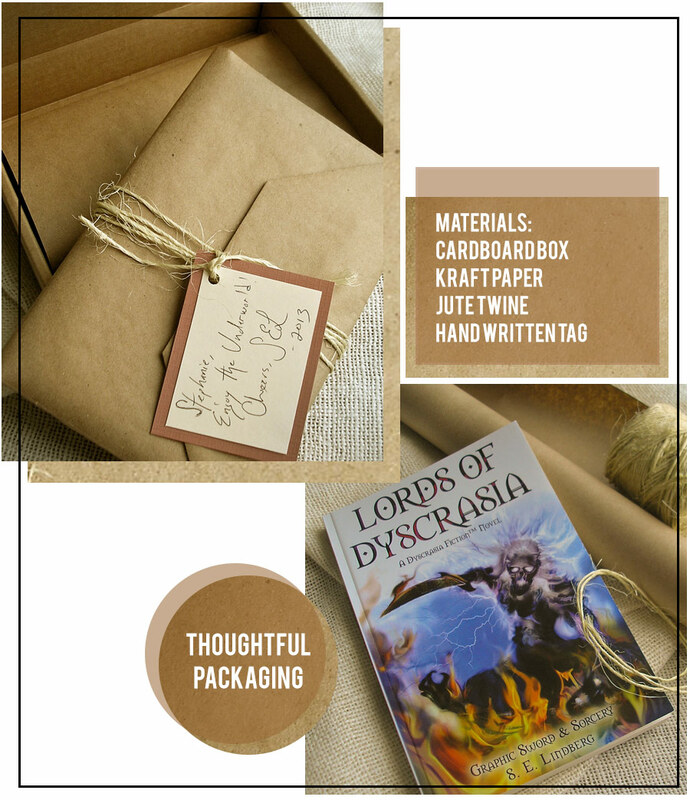 The packaging features a handwritten note with well-folded Kraft paper; a presentation to enhance the First Moment of Truth for Lords of Dyscrasia readers. 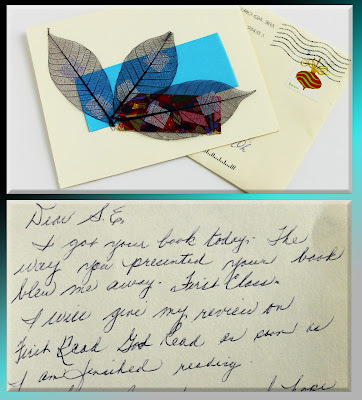 "Dear S.E., I got your book today. The way you presented your book blew me away. First Class. I will give my review on First Read Good Reads as soon as I am finished reading. Good luck to you. I hope you sell a million. Sincerely, [reader]"
Time to address "The Dying Earth" and Your-Own-To-Read pile! 1) Jack Vance: With the recent passing of Jack Vance , we’ll reflect on his work this Summer (July-August): Link to Jack Vance Groupread. An ideal time to read/discuss The Dying Earth series. 2) To-Read Pile: A second group read with the theme of “Anything in your own To-Read pile.” The perfect excuse to read your ever-growing To-Read pile. Choose a Sword & Sorcery book from there, then confess why you haven't read it sooner here: Link to To-Read Groupread! Masthead: As always, the masthead banner image for the group reflects these.